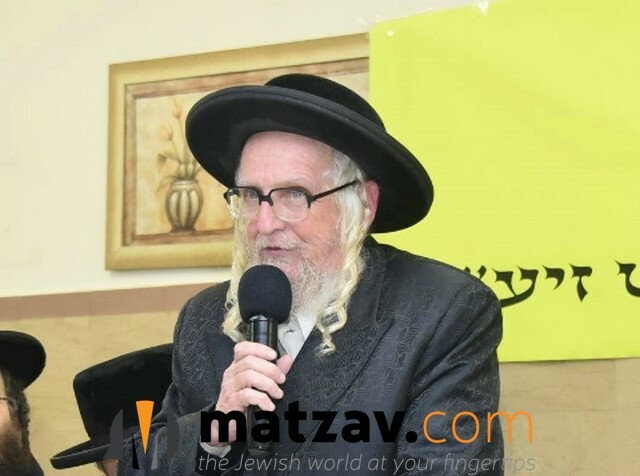 It is with great sadness that Matzav.com reports the sudden passing of the Zlotchuver Rebbe, Rav Mordechai Meir Michlovitz zt”l. He was just 61 years old. This afternoon, Erev Shabbos, the Rebbe collapsed at his home on Rechov Harav Kotler in Bnei Brak. Paramedics arrived at his home and performed lengthy resuscitation efforts, but the Rebbe passed away a short time later. Just yesterday, the Rebbe participated in the wedding of a grandchild of his father-in-law, the Kaliver Rebbe in Bet Shemesh. The Rebbe was born in Netanya on 13 Nissan תשט”ו to his father, Rav Yechiel Michel of Zlotchuv, and his mother, Rebbetzin Miriam. In his youth, he attended Yeshivas Chachmei Lublin in Bnei Brak, where he became a close talmid of Rav Shmuel Halevi Wosner zt”l. In 1986, the Rebbe married his wife, a daughter of the Kaliver Rebbe. She passed away several months ago. The Rebbe led his bais medrash on Rechov Harav Shach in Bnei Brak, whose leadership he assumed after his father’s petirah. The Rebbe is survived by his only son, Rav Avrohom Matisyahu Pinchos Michlovitz. The levayah is slated to be held on Motzoei Shabbos.